Traders are waiting for Draghi’s speech this week and today German ZEW Economic Sentiment may support EUR against USD. 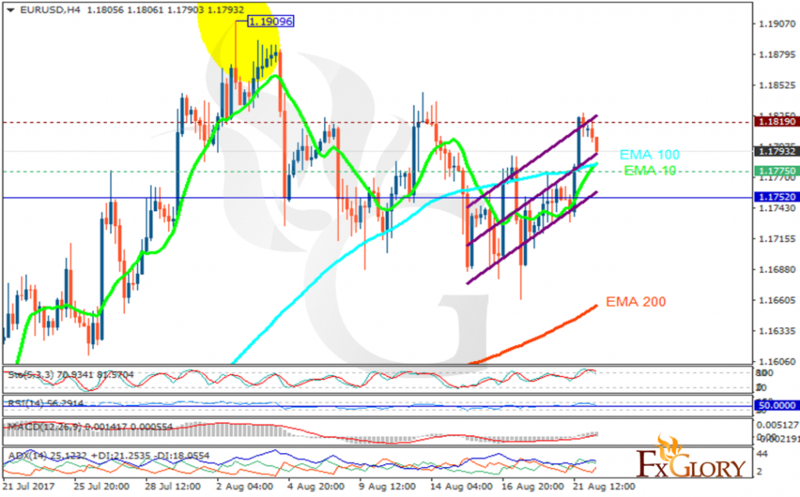 The support rests at 1.17750 with resistance at 1.18190 which both lines are above the weekly pivot point at 1.17520. The EMA of 10 is moving with bullish bias along the ascendant channel and it has reached the EMA of 100; besides, they are both above the EMA of 200. The RSI is falling down towards the 50 level, the Stochastic is showing downward momentum and the MACD indicator is in positive territory. The ADX is not showing any clear signals. Long positions are recommended targeting 1.185; however, the support level breakthrough can bring sellers back to the market to target 1.173.